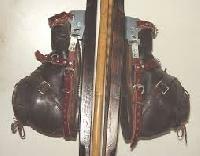 The bindings secure only the toe of the boot to the ski. Cross Country boots are similar to running shoes. The boots for free technique are more rigid and have more ankle support than the boots used for classic technique. For classic technique, the poles should extend to the armpit while standing. Baskets at the bottom of the poles provide a base for a strong pushoff. For free technique, the poles are generally longer and stiffer and extend to the chin or mouth of the skier. The baskets and tips are designed like classic poles. The skis used in cross country are lighter and narrower than those used in alpine skiing and have long curved tips. The minimum length of skis for the classical events is between 1.95 and 2.10 metres, while the average length for skating or free technique skis is between 1.70 and 2 metres. The tips of skating skis also curve more. The wax a skier chooses can often be the difference between winning and losing. Knowing what wax to use is determined by snow and weather conditions. There are two types of wax: glide wax and kick wax, also known as grip wax. Glide wax is used to decrease the friction between the skis and the snow. Kick wax is used to increase friction between the skis and the snow in order to prevent slipping. Uses stretch fabric hugging the body, similar to a runners training clothing. Woollies and thick socks are definitely no longer fashionable. Ski touring is done off piste and outside of ski resorts. Tours may extend over multiple days. Typically, skis, bindings, and boots allow for free movement of the heel to enable a walking pace, as with Nordic disciplines and unlike Alpine skiing.Ski tourings subgenre ski mountaineering involves independently navigating and route finding through potential avalanche terrain, and often requires familiarity with meteorology along with skiing skills. Ski touring can also be faster and easier than summer hiking in some terrain allowing for traverses and ascents that would be harder in the summer. Skis can also be used to access backcountry alpine climbing routes when snow is off the technical route, but still covers the hiking trail.In some countries, organizations maintain a network of huts for use by cross country skiers in wintertime. For example, the Norwegian Trekking Association maintains over 400 huts stretching across hundreds of kilometres of trails which are used by hikers in the summer and by skiers in the winter. Cross country skiing has two basic propulsion techniques, which apply to different surfaces: classic (undisturbed snow and tracked snow) and skate skiing (firm, smooth snow surfaces). The classic technique relies on a wax or texture on the ski bottom under the foot for traction on the snow to allow the skier to slide the other ski forward in virgin or tracked snow. With the skate skiing technique a skier slides on alternating skis on a firm snow surface at an angle from each other in a manner similar to ice skating. Both techniques employ poles with baskets that allow the arms to participate in the propulsion. Specialized equipment is adapted to each technique and each type of terrain.A variety of turns are used, when descending.Both poles can be used simultaneously (double poling), or alternating, in classic the alternating technique is most common (the diagonal stride) while in the skating technique double poles are more common. The classic style is often used on prepared trails (pistes) that have pairs of parallel grooves (tracks) cut into the snow. It is also the most usual technique where no tracks have been prepared. 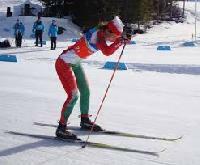 With this technique, each ski is pushed forward from the other stationary ski in a striding and gliding motion, alternating foot to foot. With the diagonal stride variant the poles are planted alternately on the opposite side of the forward striding foot; with the kick double pole variant the poles are planted simultaneously with every other stride. At times, especially with gentle descents, double poling is the sole means of propulsion. On uphill terrain, techniques include the side step for steep slopes, moving the skis perpendicular to the fall line, the herringbone for moderate slopes, where the skier takes alternating steps with the skis splayed outwards, and, for gentle slopes, the skier uses the diagonal technique with shorter strides and greater arm force on the poles.